The GameStick is the second of two Kickstarter-backed Android-powered game consoles announced in the past 12 months, and its arguably the less visible of the two (the other being OUYA, of course). It's a bit different than the OUYA as well, in terms of both form factor and specs: the GameStick is roughly the size of a USB thumb drive and runs a dual-core Amlogic processor, rather than the Tegra 3 found in the OUYA. 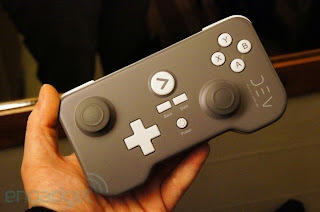 Similar to the OUYA, the GameStick also comes with a proprietary wireless controller -- the standard four button layout, two analog sticks, two shoulder buttons, and a d-pad make up its inputs -- though the GameStick's controller is actually the bulk of the hardware. The GameStick itself actually nestles into the back of the controller, making the whole bundle rather portable. But perhaps you already know all of this? 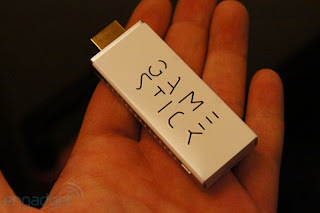 We have been hearing about the GameStick for some time now. Should that be the case, you'll wanna know how the thing actually feels, and we can deliver that just beyond the break, as we've just put GameStick and its controller through the paces. Despite looking awkwardly rectangular, the GameStick's angles aren't a hindrance in usage. The gamepad feels more than serviceable for the hypercasual games its PlayJam service employs the controller with. Buttons are appropriately springy and the analog sticks feel responsive (they also double as buttons, allowing you to click them in). Unlike the final unit which will house the actual GameStick itself inside, the dev units keep the thumbdrive-esque GameStick separate. Shoulder buttons felt a bit dull, as did the d-pad -- PlayJam promises to improve the d-pad in the final model, though no word on those not-so-squishy shoulder buttons. The console's UI is rather spartan, similarly to the OUYA's -- a left rail holds games, media, a profile page, and settings. Enter into the games section and you'll see a section for popular games and a section for all games. That's it. The media section currently houses a Netflix app and the previously announced XMBC integration. The profile page displays ... well, your profile (naturally), recent purchases, in-game achievements, and displays your account's balance (should you wish to buy any games). It stands to reason that this will expand dramatically as time goes on, especially given the current dev kit-only release of the GameStick. We also got a chance to check out the dock that'll eventually arrive with GameStick's retail version, which features a whole mess of ports and is also in a prototype stage at this point. It's still a prototype, so we're reserving some criticism for now, but its current state isn't what we'd call "solid." The plethora of ports is welcome, as is the ability to not have the GameStick sticking out of the back of your TV's HDMI ports, but it looked and felt rather cheap. Overall, the system feels like its off to a strong start, though -- as tends to be the case with these things -- it all depends on the content available. Thus far, a variety of not-so-thrilling Android games are available, but we're hopeful for the future. 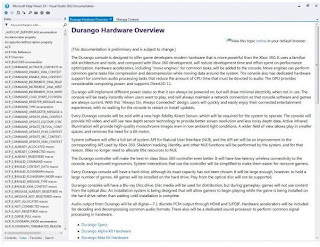 We have seen so many leaks about Xbox vNext codenamed Durango. 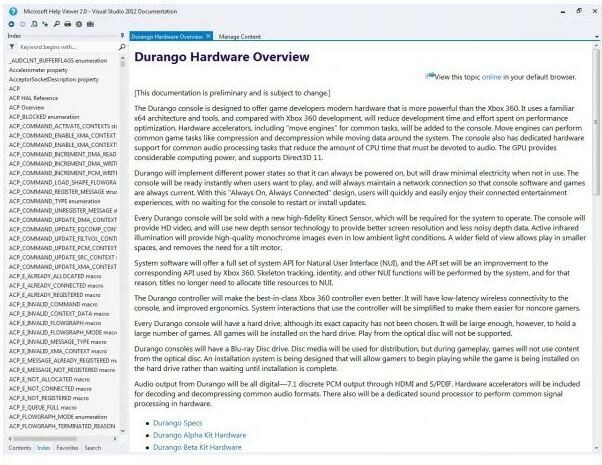 The latest leak published by VGLeaks involves Xbox vNext XDK help documents. It confirms many things about various other leaks we had it in the past. The Xbox vNext will be based on x64 architecture with DirectX3D 11 support and dedicated audio chip to process it separately. The interesting thing it reveals is the "Always On, Always Connected" mode. In this mode, the console will remain on with minimum power draw and will uses can enjoy the entertainment experience whenever they want with out any delay. You need not wait for the system to update or you need not restart it. It also comes with a high fidelity Kinect 2.0 with HD video support, more accurate skeletal tracking using new depth sensor. The new controller will have less wireless latency and improved ergonomics. Also the console with have Blu-ray disc support, however you need to install all the games to Hard disk to play it. An updated version of Kinect for Window's software development kit will be available from the device's official site on Monday, March 18, Microsoft's Bob Heddle announced today during Engadget's ongoing Expand event in San Francisco. Perhaps most importantly, SDK version 1.7 will include "Kinect Fusion," Microsoft's at-home 3D modeling solution that allows the Kinect to capture and fabricate real-time 3D models of people and objects. We first saw this technology in action way back in August of 2011, when the concept surfaced as a Microsoft Research project. Additionally, the new SDK also includes "Kinect Interactions," which adds support for new gestures such as "push-to-press" and "grip-to-pan," as well as "support for smart ways to accommodate multiple users and two-person interactions," according to Engadget. Technology project GlassUp plans to support Windows Phone. The idea is to turn a pair of glasses into a heads-up display, adding an extra display for smartphone owners. How does it work? 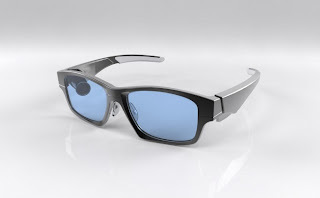 The pair of glasses sports a projector to display information on the right lens at a resolution of 320x240. Facebook, Twitter, emails and SMS and more have been provided as examples. It's reported that augmented reality will also be on the cards, though it's still early days and we're holding off our judgement on the product for now. Two versions are believed to be in development, each supporting Bluetooth 4 and 3.1 respectively. €299 ($388) is the pre-order price with the expected shipping month of September later this year. It's stated that initially the products will only sport compatibility with iOS and Android products, but Windows Phone (as pictured above) will be targeted in due course. Competing with Google's concept, it'll be interesting to see if the cheaper option will prove popular enough to take off. 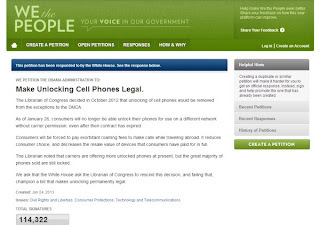 Back in February we told you about the petition that had been started at the government's We the People petition site with the goal being for the Obama Administration to overturn the ridiculous 'law' that made it illegal for consumers to unlock their smartphones. Not surprisingly, the requisite 100,000 signatures needed in order to require a reply from the White House was quickly met and all that remained was that reply; which we finally got today. As it turns out the White House agrees with the 114,000+ (final signature count by the cutoff point), and they go even one step further by suggesting that tablets should be included as well. One of the reasons the White House agrees that this unlocking law needs to be changed isn't just about new devices, but also those smartphones and tablets that are bought second hand and consumers' choices. 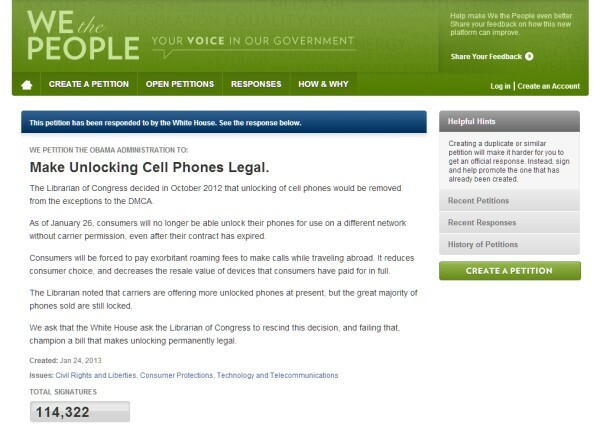 According to the statement issued by the White House (see the full statement below) the Obama Administration would support a range of options in order to address the issue, even to the point of extremely narrow legislation that would make it clear that neither technological locks, or criminal law, should prevent the consumer from switching carriers when they are no longer bound by a service contract. It should be noted that the Federal Communications Commission (FCC) is backing the government on this issue. Thank you for sharing your views on cell phone unlocking with us through your petition on our We the People platform. Last week the White House brought together experts from across government who work on telecommunications, technology, and copyright policy, and we're pleased to offer our response. The White House agrees with the 114,000+ of you who believe that consumers should be able to unlock their cell phones without risking criminal or other penalties. In fact, we believe the same principle should also apply to tablets, which are increasingly similar to smart phones. And if you have paid for your mobile device, and aren't bound by a service agreement or other obligation, you should be able to use it on another network. It's common sense, crucial for protecting consumer choice, and important for ensuring we continue to have the vibrant, competitive wireless market that delivers innovative products and solid service to meet consumers' needs. This is particularly important for secondhand or other mobile devices that you might buy or receive as a gift, and want to activate on the wireless network that meets your needs — even if it isn't the one on which the device was first activated. All consumers deserve that flexibility. The White House's position detailed in this response builds on some critical thinking done by the President's chief advisory Agency on these matters: the Department of Commerce's National Telecommunications and Information Administration (NTIA). For more context and information on the technical aspects of the issue, you can review the NTIA's letter to the Library of Congress' Register of Copyrights (.pdf), voicing strong support for maintaining the previous exception to the Digital Millennium Copyright Act (DMCA) for cell phone carrier unlocking. Contrary to the NTIA's recommendation, the Librarian of Congress ruled that phones purchased after January of this year would no longer be exempted from the DMCA. The law gives the Librarian the authority to establish or eliminate exceptions — and we respect that process. But it is also worth noting the statement the Library of Congress released today on the broader public policy concerns of the issue. Clearly the White House and Library of Congress agree that the DMCA exception process is a rigid and imperfect fit for this telecommunications issue, and we want to ensure this particular challenge for mobile competition is solved. The Obama Administration would support a range of approaches to addressing this issue, including narrow legislative fixes in the telecommunications space that make it clear: neither criminal law nor technological locks should prevent consumers from switching carriers when they are no longer bound by a service agreement or other obligation. We also believe the Federal Communications Commission (FCC), with its responsibility for promoting mobile competition and innovation, has an important role to play here. FCC Chairman Genachowski today voiced his concern about mobile phone unlocking (.pdf), and to complement his efforts, NTIA will be formally engaging with the FCC as it addresses this urgent issue. Finally, we would encourage mobile providers to consider what steps they as businesses can take to ensure that their customers can fully reap the benefits and features they expect when purchasing their devices. We look forward to continuing to work with Congress, the wireless and mobile phone industries, and most importantly you — the everyday consumers who stand to benefit from this greater flexibility — to ensure our laws keep pace with changing technology, protect the economic competitiveness that has led to such innovation in this space, and offer consumers the flexibility and freedoms they deserve. In the future, there may not be any more single-player games—but that doesn't mean what we seem to think it does every time some big publisher opens its big mouth and tells us that single-player games are dead. Epic, story-driven campaigns aren't going away; it's just that new forms of multiplayer are evolving in tandem with those experiences, rather than in opposition to them. Developers are exploring this new frontier in gaming, and it's the most exciting thing in the gaming world right now. At Bungie's Seattle press conference for Destiny, the Halo creators hinted that they've redefined the concept of the main menu. What I took from that was that in the future, we won't have to choose between "single player" and "multiplayer" when we're starting a game. It's all going to be the same thing, and nothing will be sacrificed to accomplish this. Games will only become more immersive as time goes on and this principle is widely adopted. Dead Space 3 provides a great example of this. The series had already done a decent job of integrating most menus into the play experience; opening your inventory projects a hologram in front of the characters' faces and doesn't pause the game, and their health is illustrated by lights integrated into their armor. It's progressive. But Dead Space 3 went much further by integrating multiplayer directly into the campaign experience. It did away with Dead Space 2's competitive deathmatches (by now it's clear to most involved that shoehorning competitive multiplayer into games that don't need it isn't pleasing anyone). Instead, a second player can jump into a friend's solo game at any checkpoint throughout the campaign. The story adapts, the game folds into itself, and suddenly you're not alone. It's really kind of amazing. And as was noted in Kotaku's Dead Space 3 review, it makes the game better. Why go to the trouble of creating a totally separate campaign just for co-op, like what Ubisoft did for Far Cry 3? Would the main storyline really have suffered if Jason's friends had occasionally picked up a flamethrower and lent him a hand burning down pot fields? Instead, a whole lot of effort was put into a secondary story with little worth of its own, its only value in the very fact that it was a cooperative experience. The Halo games played a large part in spearheading co-op in console shooters, and now Bungie is aiming to take things several steps further. You'll be able to play solo in Destiny if you want to; they've been clear on that fact. But I believe you'll be missing out, because playing with other humans sounds like it will be the real adventure. 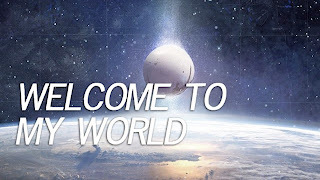 And according to the vision that Bungie has shared so far, it will happen effortlessly, with matchmaking taking place in the background and other players popping in and out of your world organically. Their goal is to make the seams all but invisible. It's the same thing thatgamecompany did with Journey, where other players would naturally appear in your game—and you in theirs—only on a much larger scale. At the press conference, Bungie co-founder Jason Jones asked, "How do we take this genre that we love so much—the first-person shooter—and turn it on its head?" But they're not just innovating in the shooter space. I think they're contributing to a larger trend that will eventually overtake the entire medium. It's all about the human element. That's a large part of what's so good about Dark Souls and Demon's Souls. I put 50 or so hours into Skyrim and got bored, but I've spent hundreds of hours in the Souls games, which are technically much smaller. I've been over the exact same environments countless times; I know by heart the location of every enemy and treasure. Yet I keep going back for more, because the human players that invade my world or summon me to theirs make it feel fresh every single time. That's what's going to make games exciting moving forward—not better graphics or gimmicky control schemes, but that irreplaceable human element. It's everything that's good about MMOs, but applied across the board in every genre. That's what's going to make games exciting moving forward—not better graphics or gimmicky control schemes, but that irreplaceable human element. And it's happening all over the place. The Arma 2 zombie survival mod Day Z took the industry by storm from the bottom up last year, inspiring compelling, unpredictable narratives about experiences between players that could never be replicated by AI, no matter how advanced it gets. And though I can't be sure, it sounds like Crytek is espousing some of the same principles with its upcoming free-to-play shooter Warface (it's big in Russia), which will be integrated with a new social platform called GFACE; in an interview with VentureBeat, CEO Cevat Yerli said that "the only place where you're alone [in GFACE] is on the login screen. Once you're logged in, you're in a realtime ecosystem." 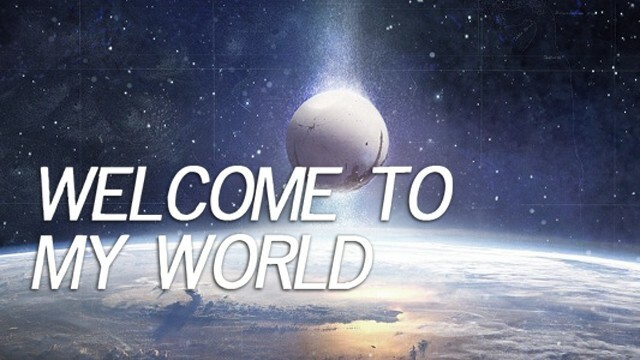 Yerli called Warface "the world's first social FPS game," which to me sounds like an echo of Bungie's made-up genre label for Destiny: the "shared world shooter." Some of what I'm saying here is hypothetical. Destiny could turn out awful, and Warface might be more freemium crap. But that doesn't temper my excitement at the idea of seamless, persistent multiplayer becoming the norm. To be able to play together without having to shoot one another in the face or actively seek out co-op partners is going to be a game changer. It's a bold new frontier, and one that's dependent on technology keeping up with the industry's wistful ambitions. But the rewards when our play experiences burst through the barriers between our separate screens, houses, countries, and worlds, without us ever realizing how gargantuan that accomplishment really is, will be well worth whatever growing pains are necessary to get there. 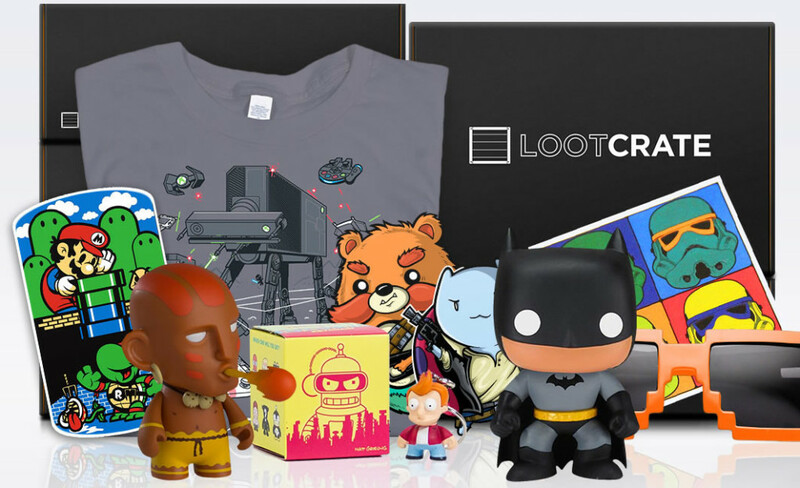 Here’s $5 OFF your first Loot Crate! Copyright ��️ | by Designscrazed.